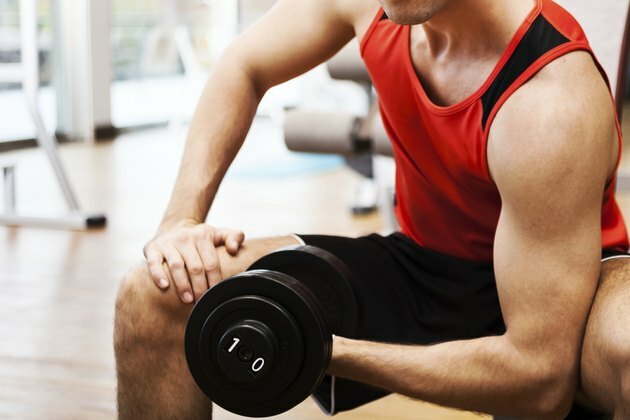 What Causes Exertion Headaches While Lifting Weights? Exertion headaches develop either during or soon after strenuous activities. Often referred to as weightlifter's headaches or exercise headaches, they usually manifest as a throbbing sensation that affects both sides of the head. However, some people may only experience the discomfort to the right or left side of the head. When you develop an exertion headache, it can last for five minutes to upward of 48 hours. Primary exertion headaches are typically the result of increased pressure in the chest or even tension in the abdominals, according to Johns Hopkins School of Medicine. The act of lifting weights can exert enough stress or strain on the muscles of the chest and abs that you develop a headache. The reason the increased pressure or tension causes this type of headache isn't well understood, but some medical professionals believe that the activity causes the blood vessels in the skull to dilate. This leads to a sudden increase in blood flow that triggers pain. The throbbing pain that follows strenuous activities isn't the most troubling aspect of an exercise headache. This type of headache is sometimes an indication of an underlying disorder, so it's important to talk to a doctor, especially when it's accompanied by vomiting, double vision, neck rigidity or loss of consciousness, advises the National Institute of Neurological Disorders and Stroke. In this situation, the headache is characterized as a secondary exercise headache. A number of different health problems can lead to an exertion headache after lifting weights. Some of the more common include brain hemorrhages, blood vessel abnormalities, spinal obstructions and sinus infections, as well as benign or malignant tumors. Your doctor can help determine if the cause of the exertion headache is primary or secondary. Once established, treatment is prescribed. Primary tension headaches respond favorably to standard headache medications. For some people, aspirin is more than enough to reduce discomfort, while others may require stronger drugs, such as indomethacin or propranolol. Indomethacin is a prescription anti-inflammatory and propranolol is a blood pressure medication. If your exertion headaches are secondary in nature, another course of treatment is necessary, based on the exact cause. Why Do I Get a Severe Headache Hours After Running?